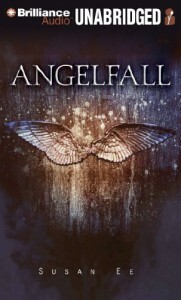 Angelfall by Susan Ee is everything that is promised by publisher and reviewers. It is fast-paced, action-packed, and has a beautiful romance. The book takes place in the San Francisco area in the near future after angels had entered the world and Archangel Gabriel had been shot. After that incident the angels had attacked the human race and turned earth into a typical dystopian world: dark, scary, and violent. The main character is Penryn who tries to survive while living with her wheel-chair bound younger sister and her crazy, schizophrenic mother. When Penryn and her family try to relocate to a safer place they stumble over a group of fighting angels that are attacking a single angel. When Penryn’s sister makes a sudden noise and catches the angels’ interest, Penryn decides to do something crazy and help the already wounded angel. In revenge the angels take Penryn’s sister with them. To get her sister back, Penryn will do everything – even work with an angel. The whole book is very fast paced. From the beginning Susan Ee won’t let us catch a breath. The story goes from one action scene to the next. The writing flows easily and everything adds up. Typical for a YA book, it is clear that the love story will develop between Penryn and the angel Raffe. But I like how Susan Ee handled the build-up. It is a build-up and no instant love. For once in a YA book the feelings of the main character make sense to me. Of course the seventeen-year-old girl is attracted to the beautiful, prefect angel. How could she not? But just because she is attracted to him that does not mean she forgets that he is the enemy, that he is part of the race that is trying to eliminate hers. It takes time to build trust. And only with trust there will be love. Ee handled this wonderfully. Penryn is a strong main character. Having grown up with her schizophrenic mother after her father left, she matured early. She learned to grow a thick skin, to take care of her family, but also to take care of herself. 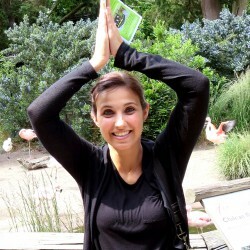 With years of self-defense classes she is able to fight and to stand up for herself. I love that. I have a big dislike for female protagonist who just stumble through dangerous worlds without any abilities and who only survive by sheer luck or someone helping her. Like that would ever happen. Only the strongest would survive. And Penryn definitively belongs to the strongest ones. Angelfall is a quick read. The 300 pages almost seem too short but since it is part of a trilogy that is forgivable. It does not make sense to read it as a stand-alone. There is no closure at the end of the book. Since the trilogy is now complete I would recommend reading all three books right after one another.